3 The LSRL minimizes the total area of the squares. The LSRL makes the sum of the squares of these distances as small as possible. 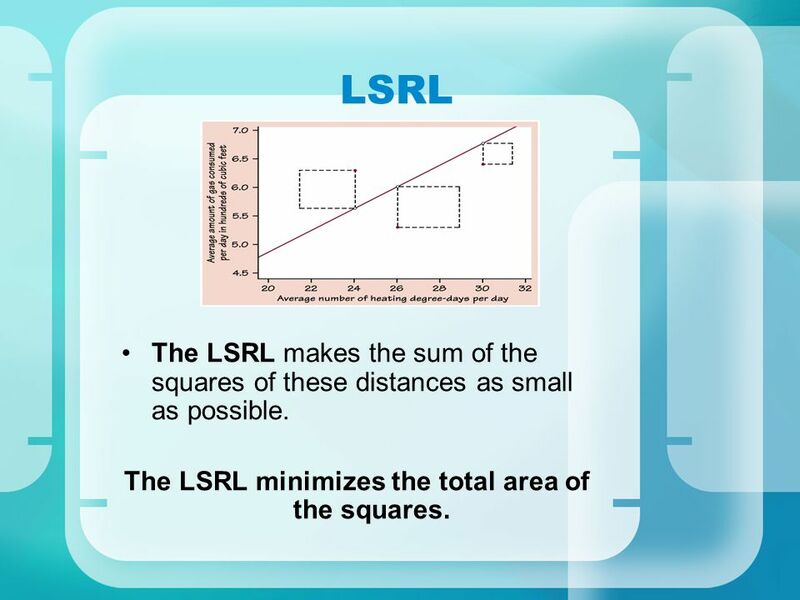 The LSRL minimizes the total area of the squares. Describes how the response variable y changes as the explanatory variable x changes. 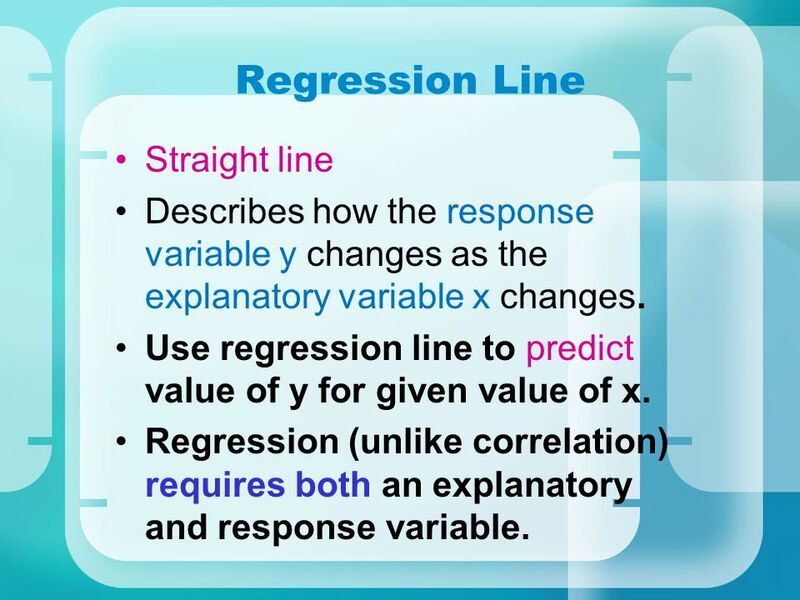 Use regression line to predict value of y for given value of x. Regression (unlike correlation) requires both an explanatory and response variable. 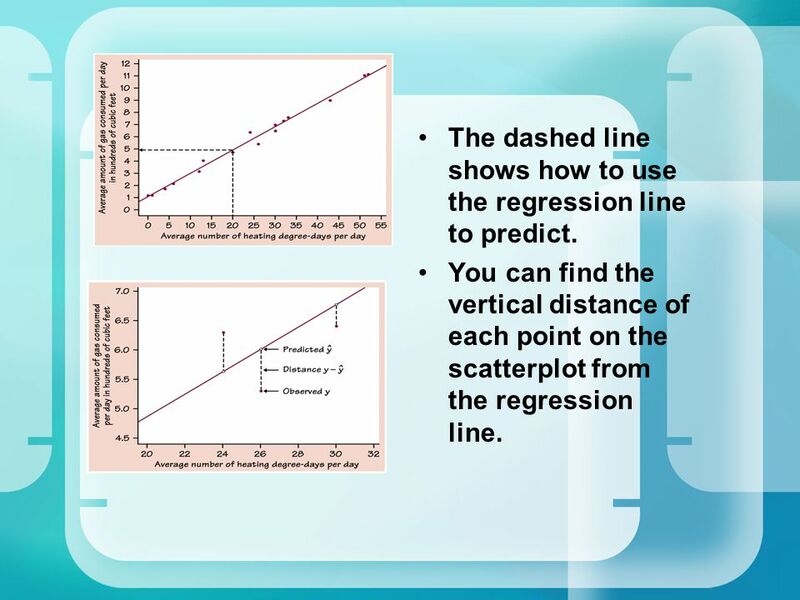 5 The dashed line shows how to use the regression line to predict. You can find the vertical distance of each point on the scatterplot from the regression line. 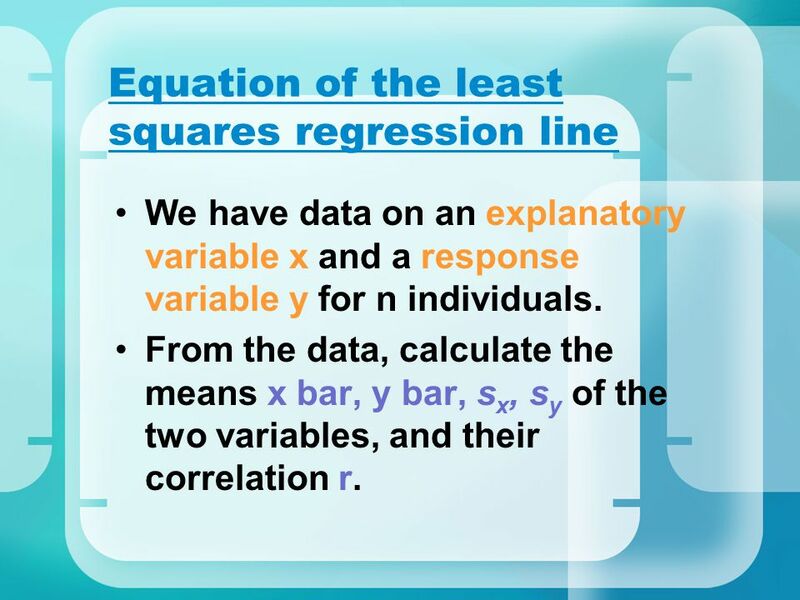 We have data on an explanatory variable x and a response variable y for n individuals. 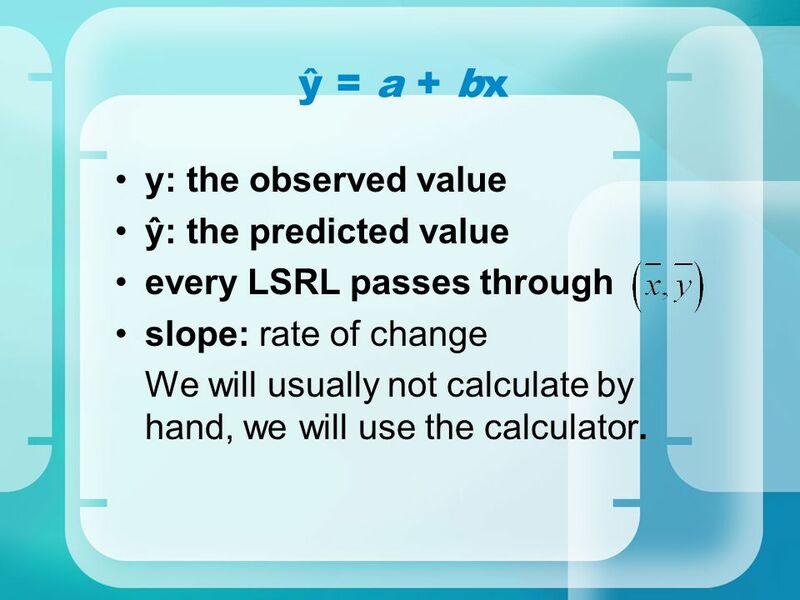 From the data, calculate the means x bar, y bar, sx, sy of the two variables, and their correlation r.
every LSRL passes through slope: rate of change We will usually not calculate by hand, we will use the calculator. 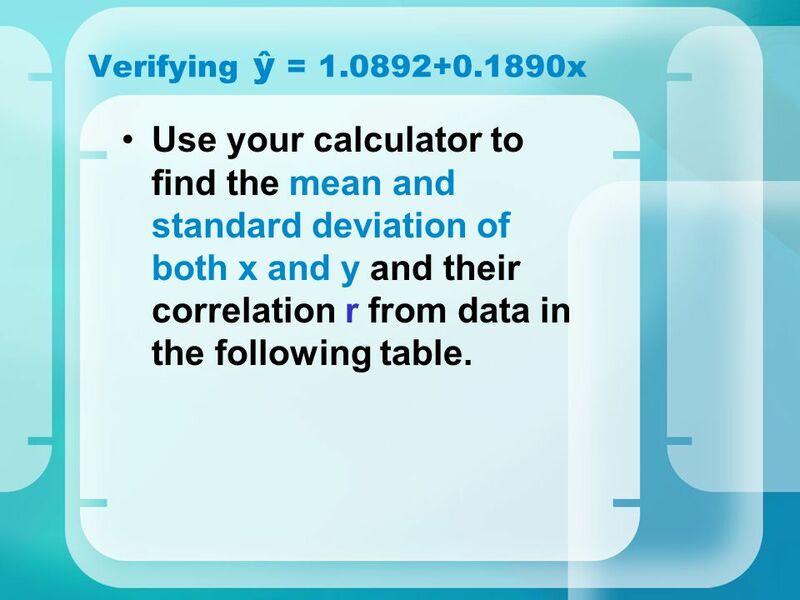 11 Verifying ŷ = x Use your calculator to find the mean and standard deviation of both x and y and their correlation r from data in the following table. 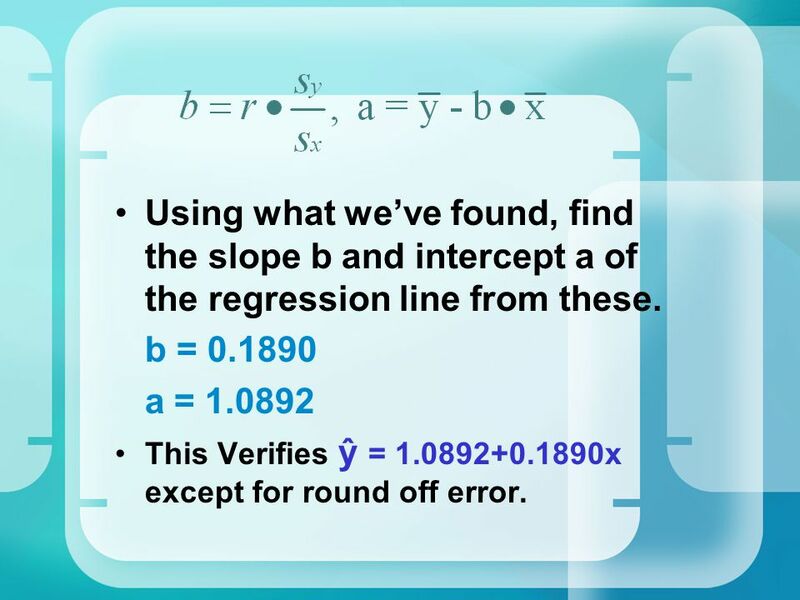 14 Using what we’ve found, find the slope b and intercept a of the regression line from these. This Verifies ŷ = x except for round off error. 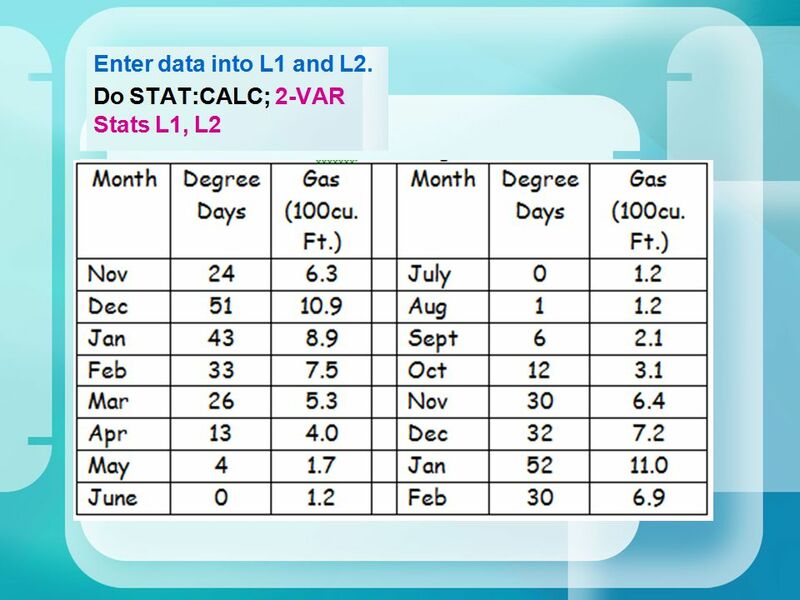 Use the same data you entered into L1 and L2. (Turn off other plots & graphs.) 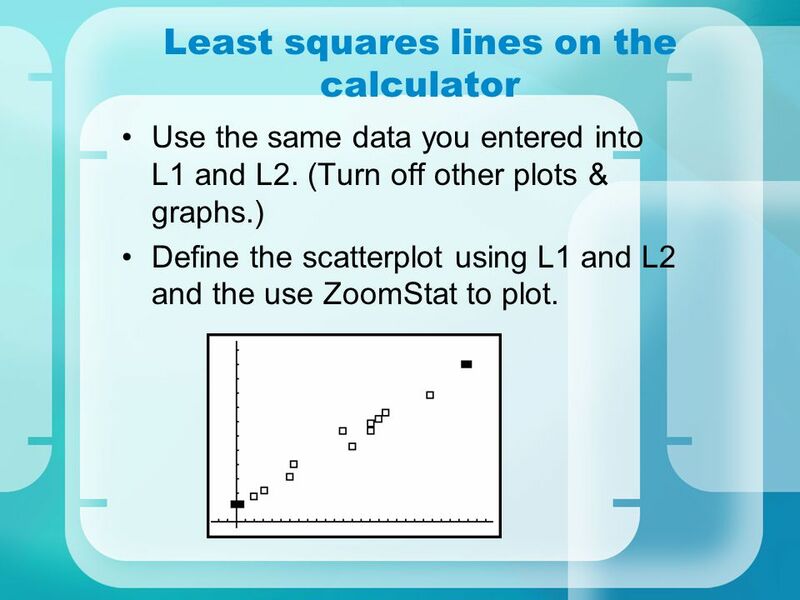 Define the scatterplot using L1 and L2 and the use ZoomStat to plot. 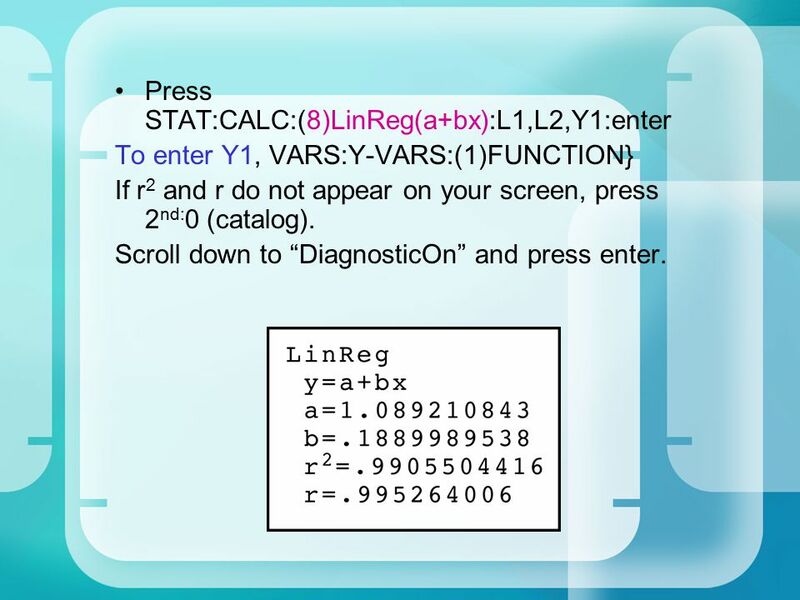 To enter Y1, VARS:Y-VARS:(1)FUNCTION} If r2 and r do not appear on your screen, press 2nd:0 (catalog). Scroll down to “DiagnosticOn” and press enter. 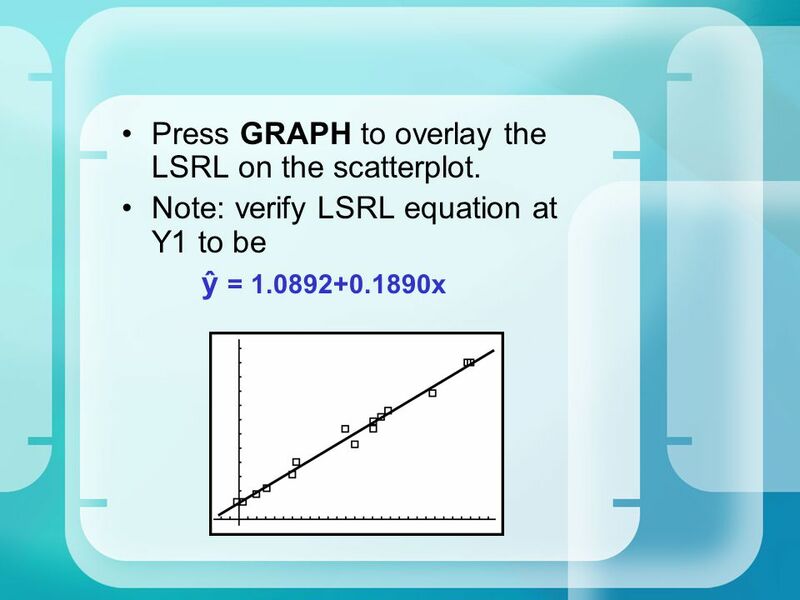 17 Press GRAPH to overlay the LSRL on the scatterplot. 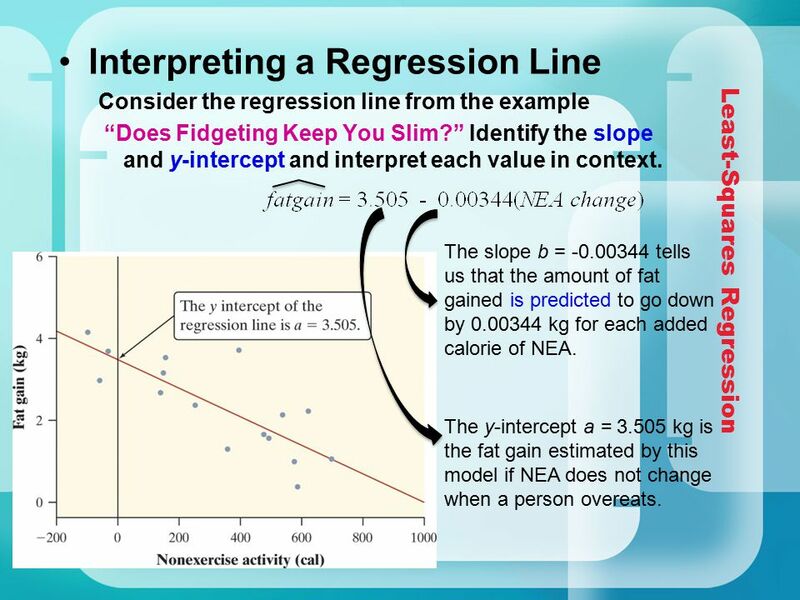 Interpreting a Regression Line Consider the regression line from the example “Does Fidgeting Keep You Slim?” Identify the slope and y-intercept and interpret each value in context. Least-Squares Regression The y-intercept a = kg is the fat gain estimated by this model if NEA does not change when a person overeats. 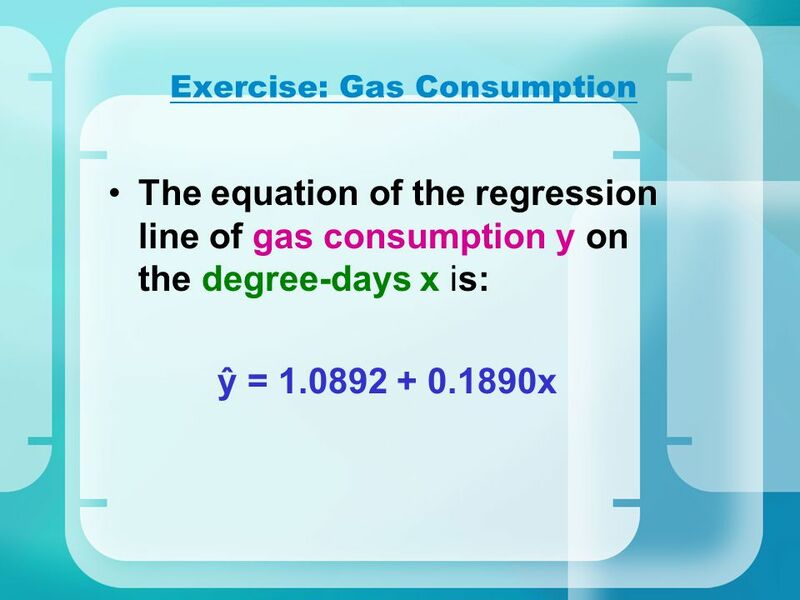 The slope b = tells us that the amount of fat gained is predicted to go down by kg for each added calorie of NEA. 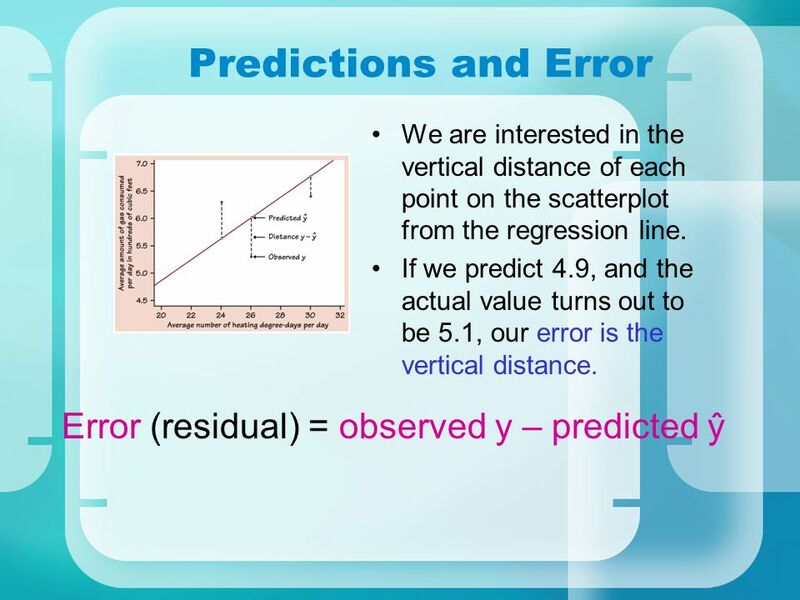 Prediction We can use a regression line to predict the response ŷ for a specific value of the explanatory variable x. 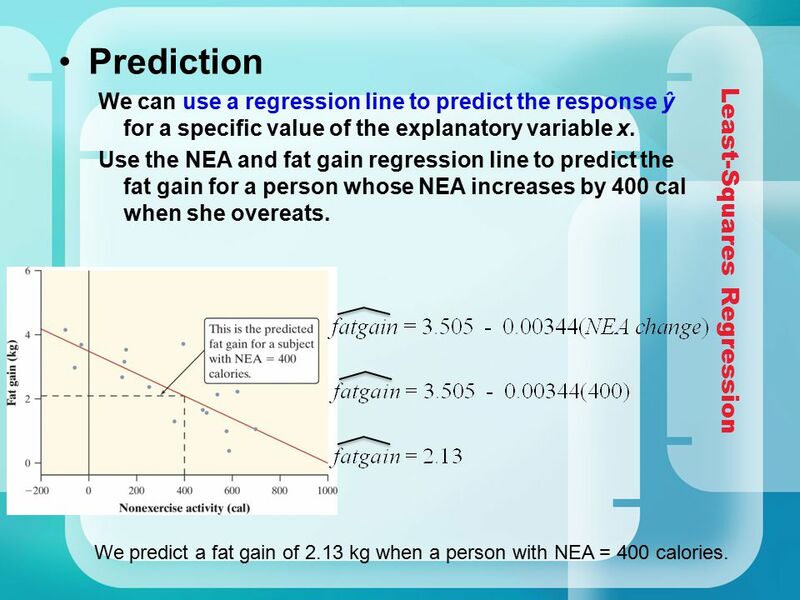 Use the NEA and fat gain regression line to predict the fat gain for a person whose NEA increases by 400 cal when she overeats. 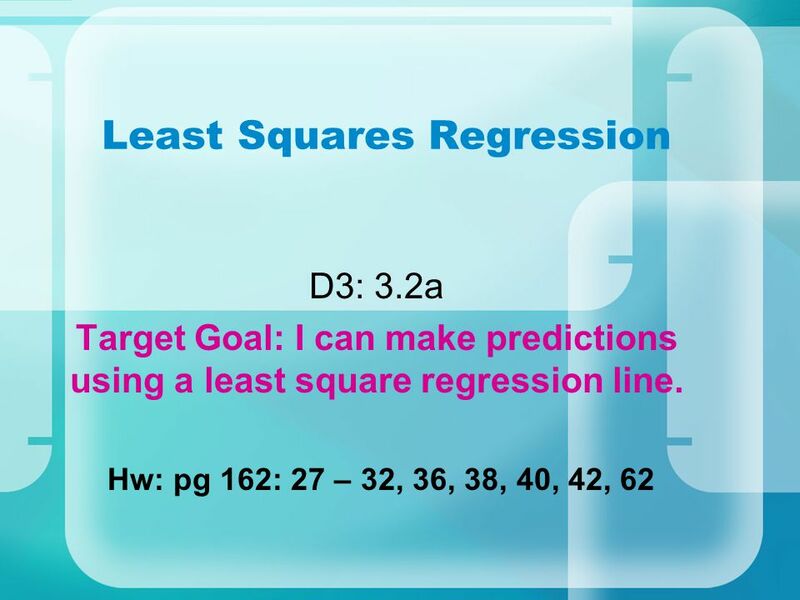 Least-Squares Regression We predict a fat gain of 2.13 kg when a person with NEA = 400 calories. 21 The slope b = tells us that the amount of Pct is predicted to go down by units for each additional pair. 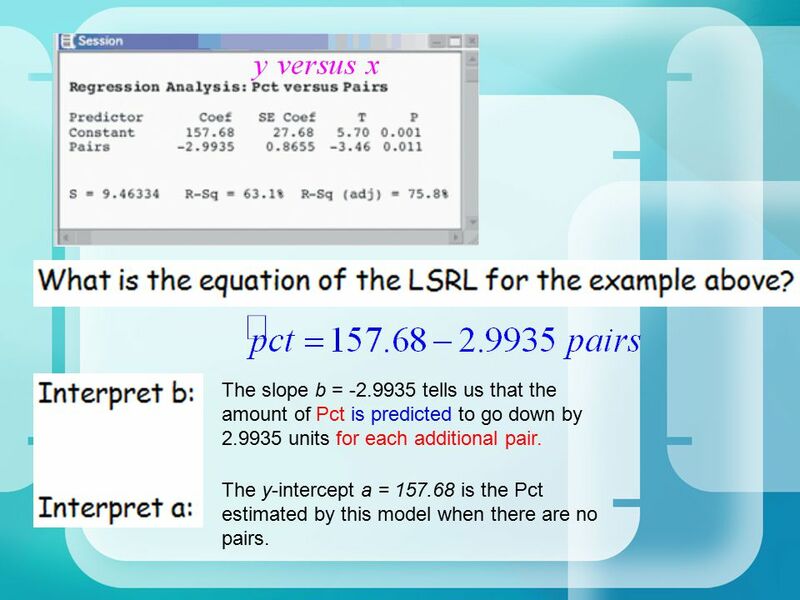 The y-intercept a = is the Pct estimated by this model when there are no pairs. 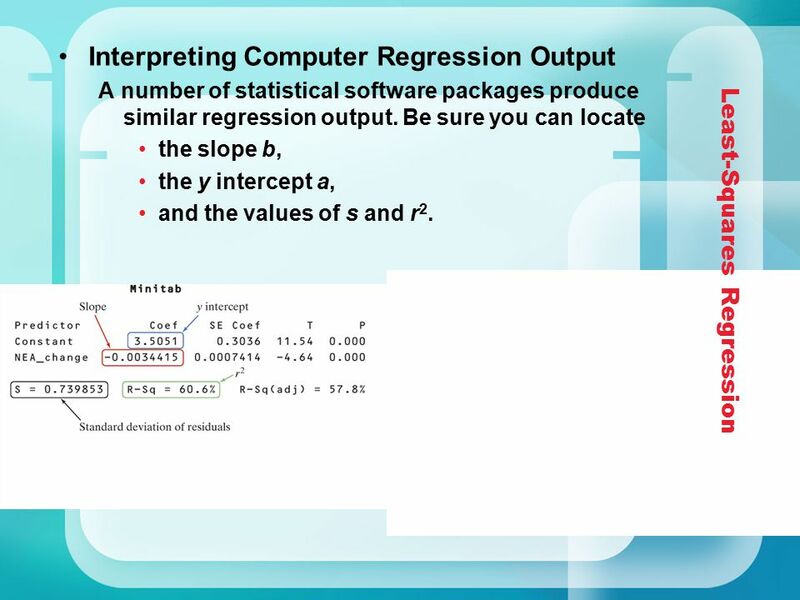 Download ppt "Least Squares Regression"
Definition  Regression Model  Regression Equation Y i =  0 +  1 X i ^ Given a collection of paired data, the regression equation algebraically describes. 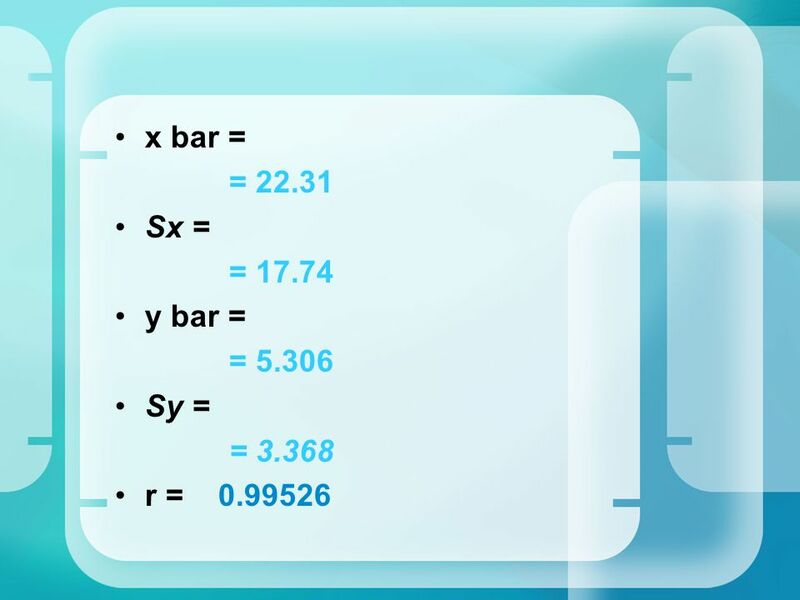 Warm up Use calculator to find r,, a, b. 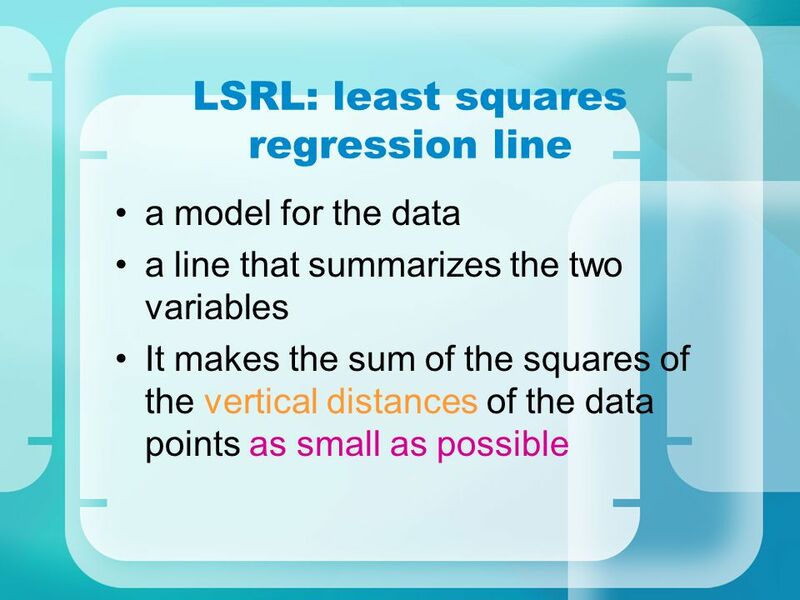 Chapter 8 LSRL-Least Squares Regression Line. Haroon Alam, Mitchell Sanders, Chuck McAllister- Ashley, and Arjun Patel. 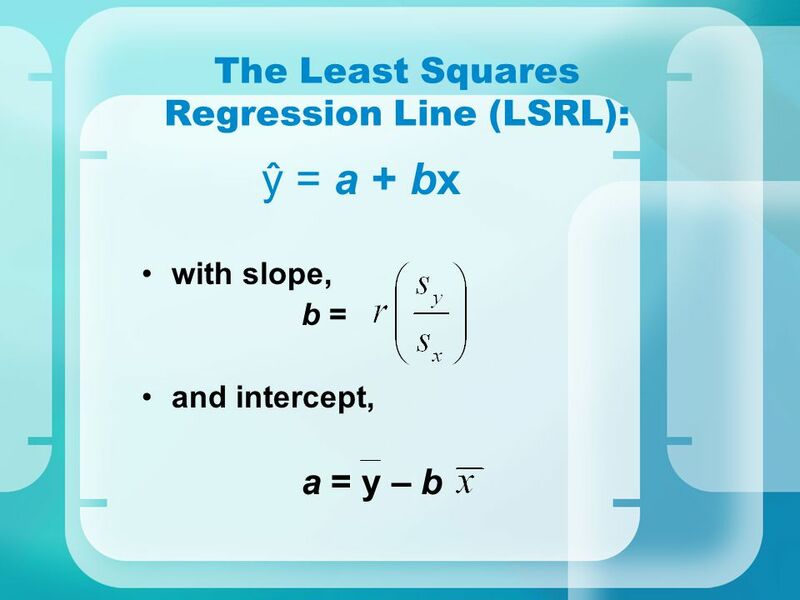 Chapter 3-Examining Relationships Scatterplots and Correlation Least-squares Regression.